Getting just the right cut can be a serious challenge. Many dudes and dude-adjacent people don't know where to start. It can be difficult to know how to choose the right haircut for your own face shape or how to choose the style that fits your lifestyle. Sometimes barbers and stylists don't educate male-aligned clients on how to make the right choices regarding hairstyle, and you're left out in the wilderness on this important choice for your look. In choosing the ideal haircut, there are several things to take into consideration: length, maintenance, and shape. Too many guys get hung up on the length of the haircut in particular. "I really want my hair long" or "I like to keep it short" are commonly heard phrases from clients. Here's the deal: The type of haircut makes a huge difference. Regardless of length, a great cut can enhance your facial features and detract from your less desirable features, so the shape of the cut should be considered before the length. You've got to consider your face shape in determining an appropriate haircut. The right cut can really play off of your best features, and minimize the less desirable ones. For example, a big nose can be minimized by wearing a fuller style with an off-center part. For dark-haired dudes with blue eyes, a very tight haircut can really make the eyes pop. Your choice of haircut can really change the way people look at your facial features. Choosing the right haircut is much more difficult than sitting down and telling your haircutter, "take it short." There are lots of things to factor in when choosing the perfect haircut, and a good barber or hairstylist should take those things into consideration. That said, it's important to arm yourself with knowledge of how your face shape, lifestyle, facial features, and profession all play their part in picking the perfect haircut before you walk in for your appointment, so you can discuss them with your stylist. With male clients, barbers and stylists are often hesitant to offer up suggestions, so don't be afraid to ask if the person who cuts your hair has ideas. If they suggests something, give it a try—remember, the person who cuts your hair is trained to give you the most flattering haircut possible, and they should be ready with suggestions if it looks like your style could use some adjustments. It is also helpful to have an idea of what you want. Take a look at hairstyle galleries online, or check out the styles of celebrities and choose a style that you like. Be realistic, and pick styles on models that have similar facial features and hair type. Print the photos you like and take them with you on your next visit. Your barber or stylist can then work with that knowledge to create a haircut that has a similar look, but is shaped in a way that works well for your face, lifestyle, and profession. It's important to take your lifestyle into consideration. Extremely active people won't want to spend a lot of time styling their hair, and they'll be happiest with a low-maintenance haircut. A haircut that is cut only to be styled won't look as good if you don't spend the time actually styling it. Conversely, someone with the time and patience to make a little effort grooming their hair every day, may be better served with a more stylish cut. We've all seen what happens when men just glob on hair gel with no direction. Another thing to consider is your profession. These days, more "traditional" rules of style in the workplace often don't apply. It's not wholly uncommon to see bankers with shaved heads, and lawyers with ponytails. Regardless, when choosing a haircut, you should consider the climate of the workplace you're in. A very traditional, conservative workplace is definitely not the place to show up with a trendy, edgy haircut. For those who serve clients, you may also wish to consider how the average customer will perceive you. Is a client going to trust you if you have a mohawk? 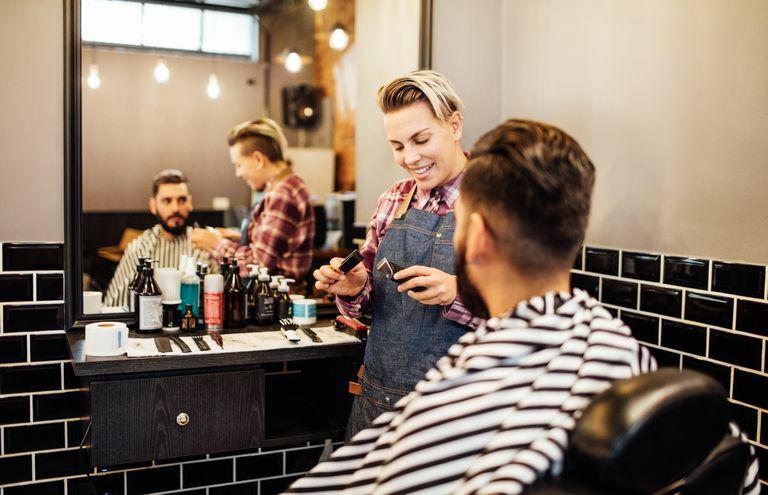 Times are changing, but still, you've got to consider your clients, as you don't want your choice of haircut to negatively impact your financial health. If you work in a conservative environment, work with your barber or stylist to choose a style that is versatile enough to allow you to style it conservatively when you're at work and still let you do something playful when you're on your own time if you'd prefer a little more edge when you're not at work. If you work in a more creative or less conservative environment, you can likely choose just about any style you like. Go full speed ahead on that mohawk.